How often you need to strength train. What exercises you should choose. How you should split your routine up. How many repetitions and sets you should perform. And we’ll finish with a sample golf strength training workout. 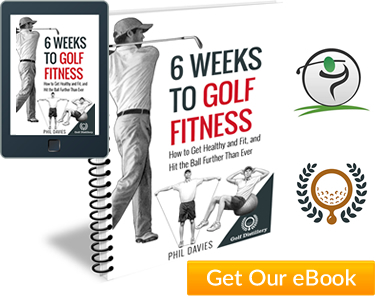 All of these guidelines are based on either scientific research into everyday golfers or on proven sports science. I think that’s important because there’s so much hype and misinfomration on the Internet nowadays. Wherever appropriate, I’ve included references so that you can trust what I’m saying isn’t just based on my own subjective opinion. Golf Strength Training Makes You Stronger But Does It Make You Better? As you might expect, strength training allows you to swing a golf club significantly faster [1-5]. But does swinging the club faster guarantee you’ll hit the ball further? Swing speed is only one factor involved in shot distance. Amongst others is the quality of the strike on the ball. If you swing faster but make a poorer contact as a result, your shots will probably travel less distance, not more! Interestingly though, golfers can increase their strength and swing speed without any negative effects on the quality of their ball striking. Perhaps, but the further you hit your drives, the easier it becomes to hit the green on your approach shots (in effect, you have a bigger target). The further you hit each iron, the more lofted a club you can take (most golfers achieve a more consistent ball strike as they move up the lofts). So, golf strength training not only allows you hit the ball further, it will probably lower your handicap as well [7,8]. 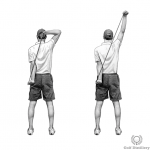 Golfers are prone to overuse type injuries – especially in the shoulders, elbows, wrists and lower back. You’ve probably had to miss out on competitions in the past due to injury, or suffer as you struggle round 18 holes. A suitable program of resistance exercises that helps to balance the body and improve posture, is one of the best ways to prevent these injuries . Get stronger and not only will get better at golf, you’ll probably play more because of it. As a golfer, particularly if you only have a very limited time to spend working out, this isn’t the best set up for you. 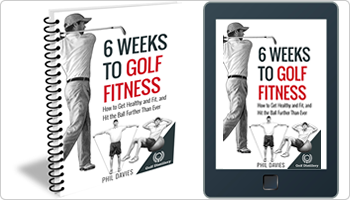 Excessive bulk will hinder your swing and working each muscle group to exhaustion 4,5 or 6 days a week will leave you too tired to play any golf (and increase your chances of injury and burn out). A much more efficient approach is to strength train 2-3 days a week following a total body workout. All the major muscle groups are worked each session but with only a small amount of exercises and sets per muscle group. Bodybuilders also tend to perform each exercise to failure each and every session, aiming to lift more than the week before. It’s a great way to get injured and burn out. To increase your strength for golf, you do need to push your body beyond its comfort zone, but not to failure on each and every exercise, each and every week. Typical gym-goers tend to stick to classic strength exercises – bench presses, lat pull downs, biceps curls etc. But athletes (and that means you as a golfer) are better served by exercises that are very specific to their sport – the same movement patterns and the same speed of movement. So whereas a fitness enthusiast might use crunches or sit ups to work their abs, that curling or crunching movement isn’t really applicable to the golf swing. A better exercise for working the abdominal region would be something rotational, like a woodchop (see the exercise to the right). A program of golf-specific strength exercises will always outperform a program of general strength exercises. 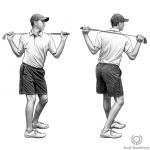 If you only work the muscles involved in the golf swing, in a way that they are used in the golf swing, your body will become quite unbalanced. Certain muscles become stronger while others become neglected. Certain areas of joints and connective tissue are placed under greater strain than others. This is something that top athletes always have to battle with and at least they have the time and dedication to work on lots of compensatory exercises as well (it’s also why professional golfers dedicate part of their practice time to hitting golf balls left-handed or vice versa). So what’s the solution for the typical club-level golfer? 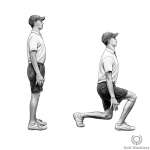 Choose a good selection of exercises – some that are specific to golf, some that are more general and designed to balance out the overall program and your body. That weight is moving very slowly despite the enormous amount of force you’re applying to it. How far could you throw that weight?Imagine you’re lifting a very heavy weight. It requires every ounce of your strength. Swing speed is a result of explosive power rather than brute strength. So how do you increase your power for golf? For the majority of club golfers, a strength training program will also increase their power at the same time [12,13]. That’s because power is product of speed and strength so you only have to improve one without decreasing the other. Golfers who are experienced strength trainers in the other hand, would benefit from incorporating some explosive power exercises, ballistics or plyometrics into their routine [12,14]. I’ll soon be adding an article on golf power training for more serious golfers and advanced strength trainers. 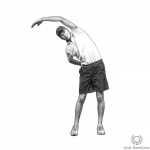 Core Stability For Golf – What Is It Exactly? As a golfer you will also benefit from excellent postural strength – we’ll define that as the ability to move and hold your torso in certain positions before, during and after the swing. You may have heard of “core stability”, which has been a bit of a buzz word in the fitness industry for a few years now. 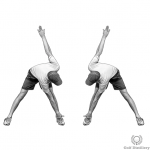 It simply relates to the strength in and around your midsection – that all important trunk area that connects the upper and lower body. 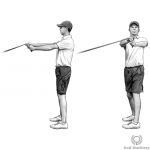 Because the golf swing is a total body movement, the stronger the physical connection between your lower and upper body, the more control you’ll have – over your timing, co-ordination and swing mechanics. Free weights exercises (using dumbbells, barbells etc.) force you to use other, smaller muscle groups in order to stabilise the body and joints as you perform each movement. So including certain free weights exercises and total body movements (instead of relying exclusively on machines) helps to build core strength. We’ll look at core stability for golf in more detail in a separate article. 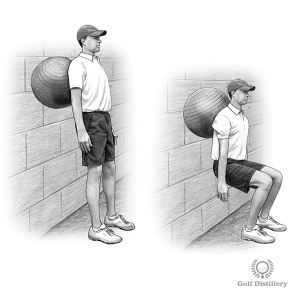 Here are some parameters for your golf strength training program. These parameters can change depending on your specific outcome, but they are good as a general rule for the majority of club golfers. Research shows that to get the majority of benefits from a golf strength training program you only need to perform 3 workouts a week. More 3 sessions a week offers little or no extra benefits. One study found that even 2 sessions a week resulted in 90% of the improvements of 3 sessions. I’d recommend 3 to begin with (6-12 weeks) and then maintain with 2 if time is an issue. 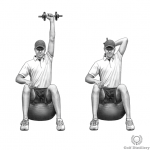 A suitable golf strength workout can be completed in around 30 minutes. Beyond 45 minutes results in diminished returns. Each session would work all the major muscle groups with just 1-2 exercises per muscle group (8-15 exercises in total per session). For most exercises you can perform 1-2 sets of 8-15 repetitions. Fewer repetitons with a heavier weights isn’t necessary and isn’t suitable for newcomers to strength training. Rest between sets for 1-2 minutes. Br J Sports Med. 2004 Dec; 38(6):762-5. J Strength Cond Res. 2009 Aug; 23(5):1606-10. J Strength Cond Res. 2007 Nov; 21(4):1166-71. Canadian Journal of Applied Physiology, 20, 480-486. Canadian Journal of Physiology and Pharmacology, 78, 656-661. Med Sci Sports Exerc. 1999 Feb; 31(2):323-30.